This is a great project for using up lovely off cuts of upholstery fabrics or samples that you can often find at the local charity shop, carboot sale or fabric seconds warehouse. The upholstery fabric is tough and gives the backpack a sturdy vintage feel. It’s also super unique and a bag your toddler will be proud to wear. It’s practical too, with a button on shoulder strap connector that can be taken right off if it is not required. It’s handy for longer walks as most straps start falling off the shoulders of little ones. The finished size of the backpack is 12” x 8.5” x 3.5”, it’s a perfect size for a walking 18month old - 4/5 year old. If you'd like to just buy one of my ones and skip the making it yourself bit, click here! 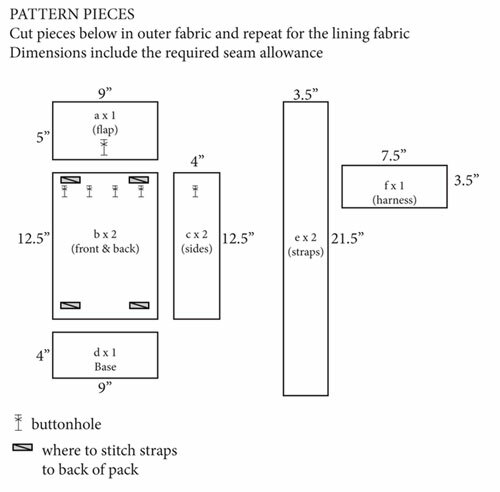 or I recommend using off cuts or samples of upholstery fabrics, the largest pieces needed will be 12.5” x 9”, I like using different coordinating patterns for each side of the backpack. You’ll also need a couple of long strips of fabric for the straps about 21.5” x 3.5” long. One cord tie approx 25” long – you can crochet or knit an i-cord or use a knitting nancy to create a cord. Alternatively just buy a coordinating piece of cord that will go with your fabrics. 2. Pin flap pieces (a) right sides together (RST), sew up leaving one long side open. Clip corners, turn out and press flat. a. Pin pieces B1, C1, B2, C2 RST (right sides together) along their long sides. 4. Repeat Step 3 for lining fabric, the only difference being that you need to leave a gap in one of the side seams of the lining fabric of 3 inches. This will be the hole that you will turn the piece through. Do not turn the lining fabric out, leave it with the wrong side facing out. 5. Take the flap piece that you made in Step 2 and pin this RST with back side of the outer bag shell. 6. Place the outer bag shell with the attached flap, inside the lining shell. The right sides of the outer and lining fabric should be together. 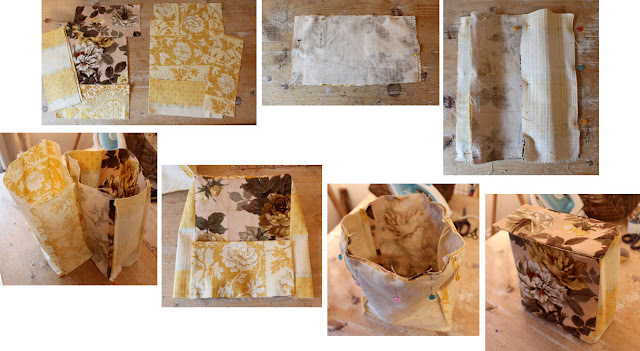 Pin along the top of the bag and sew around all four sides. 8. Mark buttonholes for the cord tie to go through as per the 1st diagram. There should be four buttonholes evenly spaced on the front and the back of the bag and one buttonhole in the middle of each side of the bag. 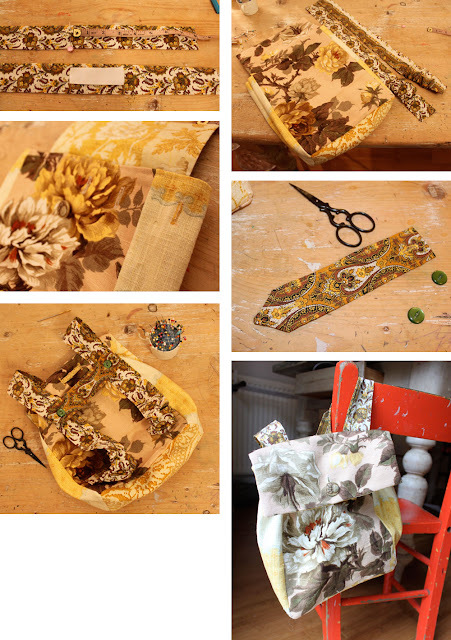 The top of each buttonhole should start 1.5” from the top edge of the bag. Sew buttonholes and clip open. d. Insert 3 inch piece of elastic 8” in from the end, pin and sew across to fasten. You can pin a safety pin to the end of the elastic to make it easier to take hold of it and stretch it through. e. Take hold of the free end of the elastic inside the tube and pull tightly and pin 2” from the end of the tube, sew across to fasten. The fabric should gather in this section only. 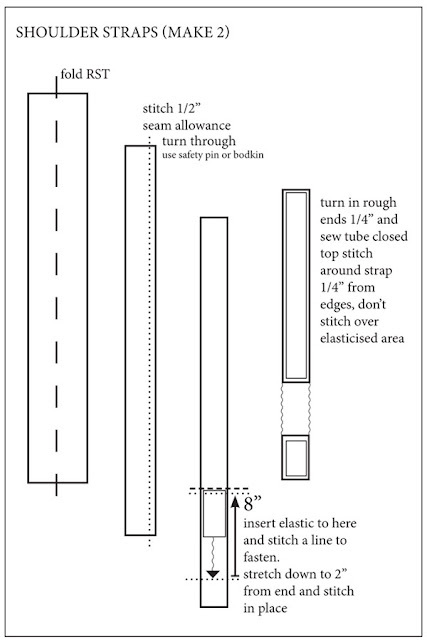 f. Turn the rough ends of the tube in about ¼” and sew closed. 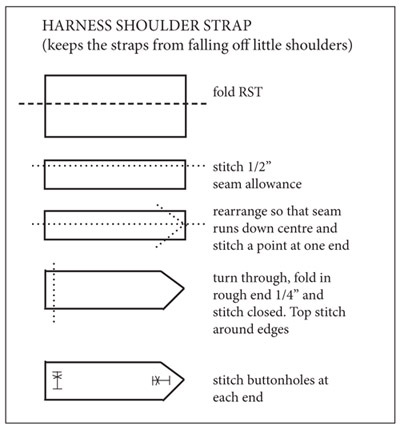 Sew a top stitch line ¼” in from the edge along each side of the strap, don’t stitch over the elasticised section. b. The bottom of the straps should sit ½” from the sides of the bag and about 1” from the bottom of the bag. c. Sew up as indicated in the diagram above. g. Mark buttonholes slightly larger than the two smaller buttons one hole on each end of the piece approx ½” from each end. 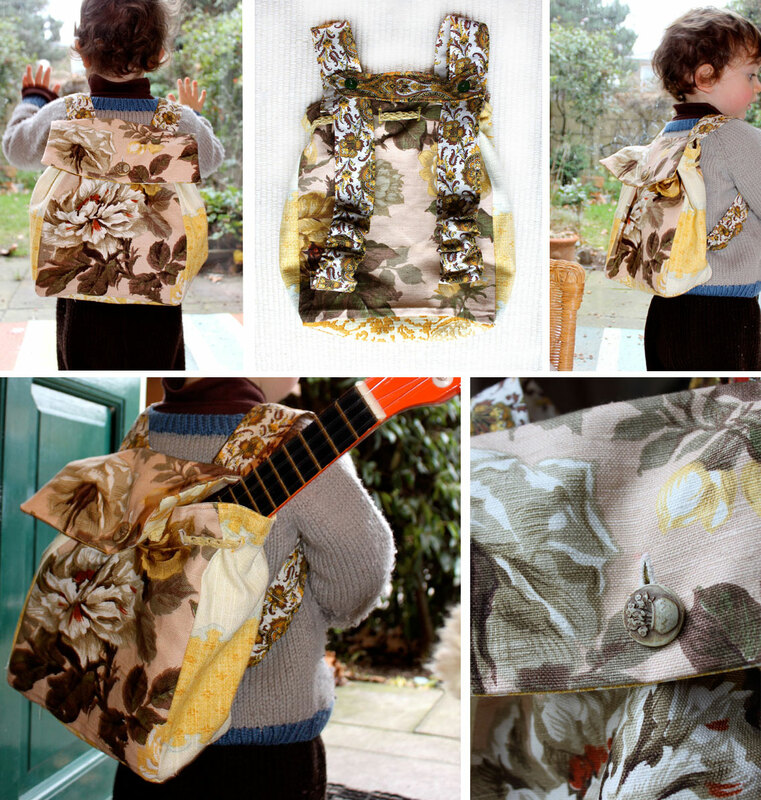 So there you have it, one lovely handmade extra special backpack for your little one. If you use this pattern, please write a comment below and let me know how it was for you. I am writing up more cute patterns for both children and adults and would love the feedback, being new to all this pattern tutorial writing. If you have any queries, please leave a comment and I'll try to respond as soon as possible. ©Brenna Jensen | This free pattern is for private use only and not for commercial gain, for further information please contact me. In the meantime, have a look at my Etsy shop for more of my handmade goodies. I was looking for a backpack tutorial that didn't involve drawstring straps and this is perfect, thanks for sharing!